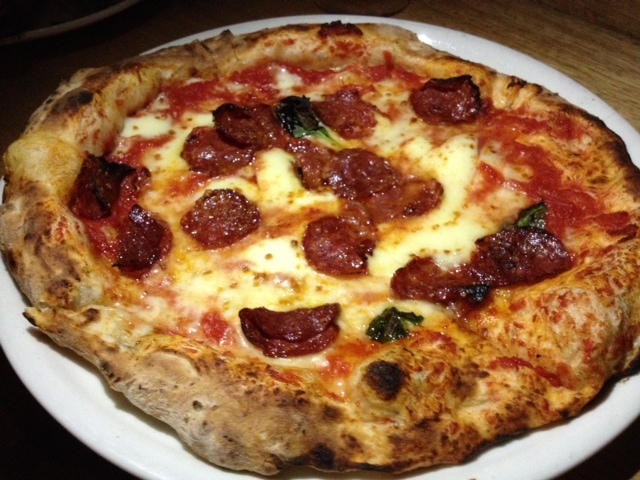 Until recently if you asked most foodies to recommend Bondi’s best pizzeria chances are they’d mention Pompei’s. But, in my mind at least, this is now debatable – with Da Orazio, the relative newcomer on the block, serving up authentic Neopolitan style pizza. It was this pizza (rather than the sparkling sands of Bondi Beach) that got me across the Harbour Bridge on a sunny Saturday winter afternoon. 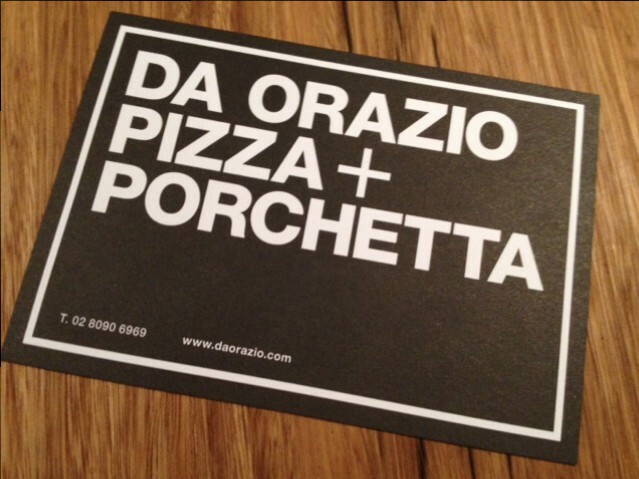 The restaurant is actually called Da Orazio Pizza + Porchetta. 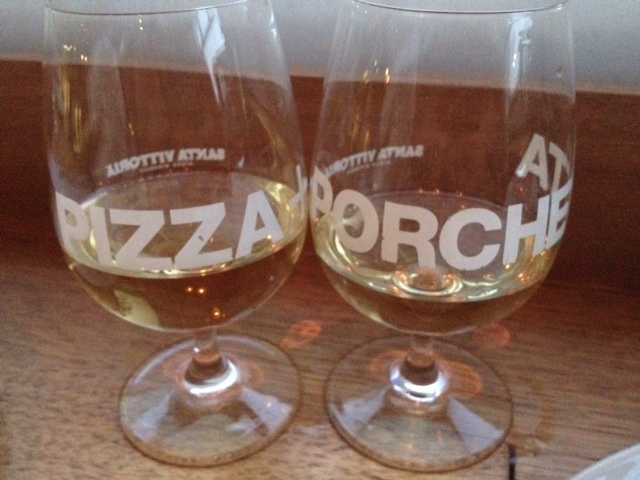 It’s a celebration of pizza but also a celebration of pork. A dream for pizza lovers and carnivores alike. Maurice Terzini, the owner, is well known for his fine dining Icebergs, and the sadly missed North Bondi Italian, both Bondi Beach institutions. Don’t visit Da Orazio expecting glorious water views – Da Orazio is tucked away in the Boheme development on Hall Street. Although it sits alongside Harris Farm and below residential apartments once inside you’ll forget this. Indeed with white tables and chairs, Italian staff and authentic but subtle touches like hanging garlic you could almost be in a modern local in Southern Italy. I say modern deliberately – this is no rustic trattoria. Everything on the menu is reasonably priced – ‘everything’ because Da Orazio even keeps the wine at ‘it would be a crime not to’ price points ($7 a glass). The wine list itself is short (perhaps too short for wine buffs) and the branded wine glasses, like the wait staff signature aprons, speak to the same cool, casual and confident character that North Bondi Italian was well known for. Despite planning dinner at Da Orazio in advance I stupidly didn’t book – I assumed it would be no reservations, just like North Bondi Italian used to be. But on turning up around 6pm on a Saturday it was fully booked. Luckily for us there’s plenty of unreserved bar stools and we were early enough to have our pick of those seats. Even at 6pm the atmosphere was buzzing. The crowd is more Eastern Suburbs families than I expected – but this no doubt changes after 7.30pm when the no booking policy kicks in and the younger crowd arrives post drinks at The Bucket List or Bondi Hardware. As I mentioned Da Orazio is as much about the pork as it is pizza. And beyond that the broad menu also includes equally tempting antipasti, salads and pasta, all of which hero the kind of simple Italian ingredients I love, like basil and buffalo mozzarella. On seeing this on the menu we knew this was going to be a pizza feast, rather than a pork one. 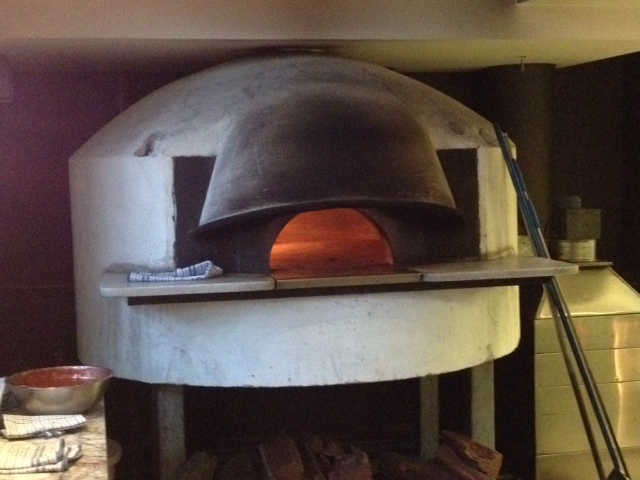 Sitting alongside the 2.7 tonne imported pizza oven we had a prime view of the pizzaiolo hard at work. Before pizza came nibbles. My preference was the popular daily house antipasto. But my husband got to choose (well it was his birthday) and he couldn’t look beyond the lamb skewers, cooked over the grill. He used ‘value for money’ as an excuse to order 10 skewers ($25) instead of 5 ($15) – I also figured 10 would be easier to share, as we’d avoid the ‘who gets the last one’ debate! 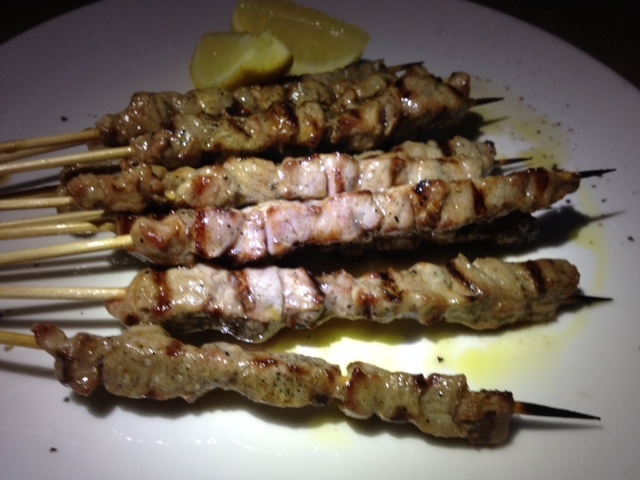 When the skewers arrived I was pleased we’d ordered 10, because they are fairly small. But every bite packs a punch and our 10 skewers were lovingly devoured. If you’re not a big red meat eater consider starting with the octopus – I’ve seen it receive great feedback. 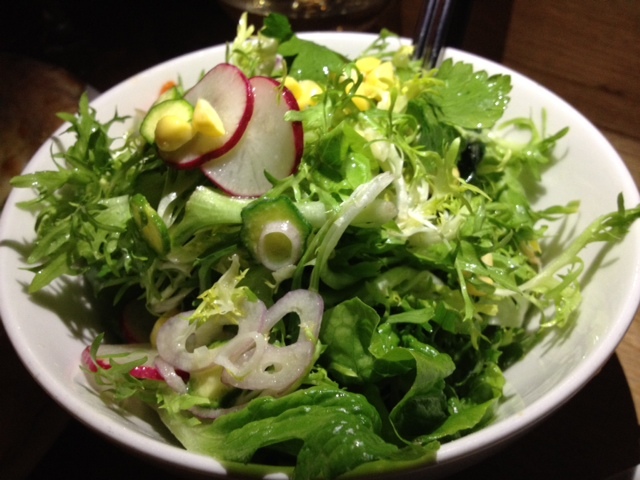 For starters we also shared the side salad. This isn’t a typical mixed leaf salad – it a mxiture of delicate leaves, zucchini and radish all brought together with a light dressing. All it needs is a little pumpkin or a few chickpeas an I’d happily eat this salad for lunch daily. 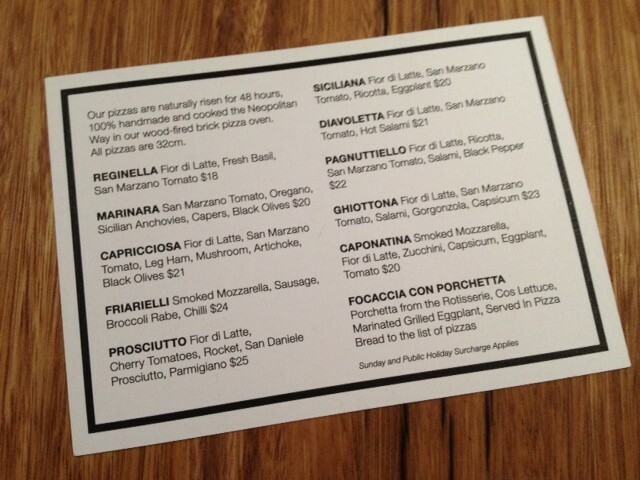 The pizza menu is just long enough to allow for pleny of choice (and gives you plenty of reasons to return). But its not so long that you get lost in a sea of similar choices. Classic Italian pizzas like the Capricciosa and Marinara appear alongside less familiar, but equally devine, options like the Ghiottona. I was pleased to see San Marzano tomatoes on the menu. They’re considered by top pizza chefs to be the best tomatoes in the world (although not typically stocked in supermarkets you can find them in speciality Italian stores). We shared two pizzas – one white based and one tomato based. 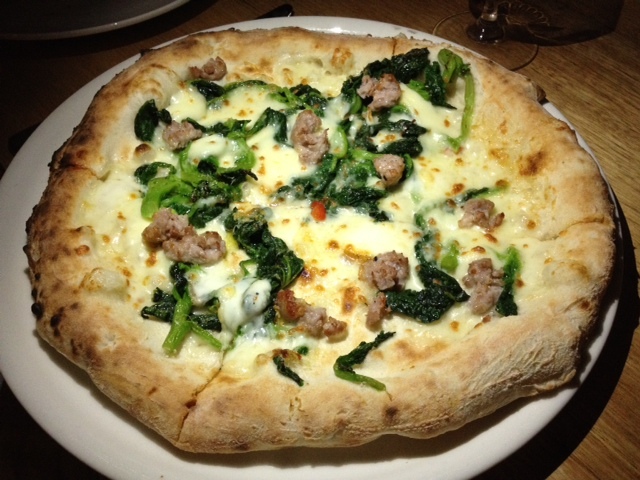 Both were perfectly formed Naples style with light dough, surrounded by an airy but slightly crunchy crust. This dough combined with top quality toppings (like the San Marzano tomatoes) puts this pizza in the same league as Sydney’s growing list of outstanding pizzerias – including Via Napoli (Lane Cove), Lucio Pizzeria (Darlinghurst) and Gigi’s Pizzeria (Newtown). What about the ‘Porchetta alla romana’? It’s slow roasted deboned and rolled Berkshire pork cooked and served the traditional Roman way. It’s available daily from 5pm until sold out and is priced according to the number of servings ($24 for 1, $45 for 2, $80 for 4). And the pasta? I read in a Gourmet Traveller write up that the pasta is as good as that at neighbouring A Tavola. If you’re not familiar with A Tavola then rest assured this means it’s worth visiting Da Orazio for the pasta alone. If you waiting for my verdict on the pork or pasta you won’t see it here. I’m saving that for my next feast. 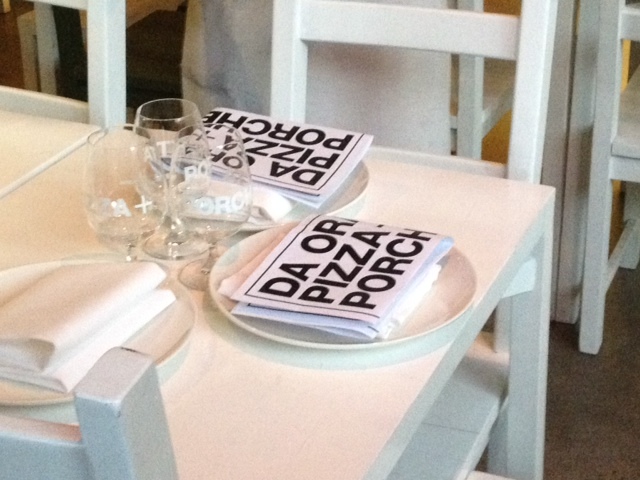 If you make it to Da Orazio in the meantime and venture beyond the pizzas then I’d love to hear about it. Make a booking – if you’re keen not to queue or you’re going with a group then make a reservation. But note you can only book until 7.30pm. 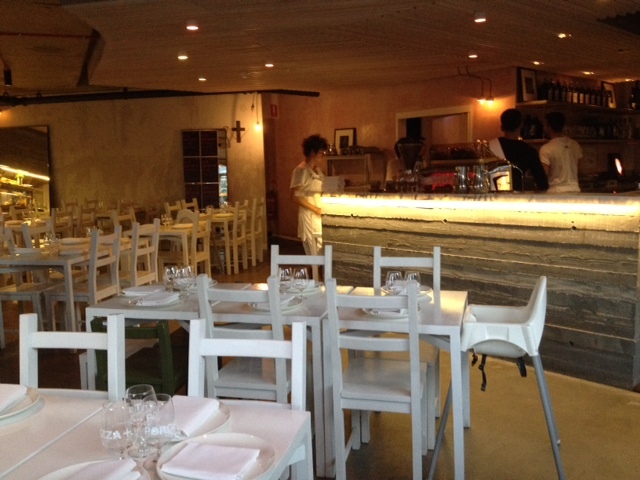 Take the kids – Da Orazio is about as child friendly as the Eastern Suburbs gets. Not only because you can book but also because there’s a ‘bambino’ menu with pastas at $10 and small pizzas at $12-$14. Leave room for dessert. The dolci options are irresistible at $9-$11. Or if you crave gelato then note that Australia’s best gelato at Gelato Messina is only a few steps away. 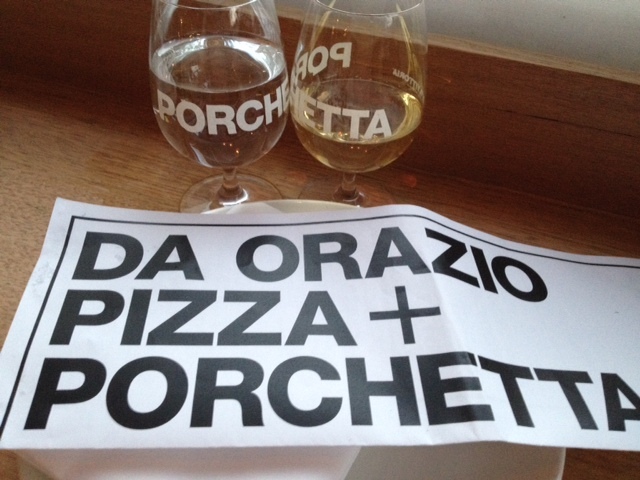 Tags: Bondi, Da Orazio Pizza and Porchetta, Italian, menu, pizza, pork, restaurant, review. Bookmark the permalink. the bubbly crust on those pizzas look fantastic! Those pizzas do look good. Love a thin and bubbly base!